Norway is ideal for cycling holidays as well as mountain or trail biking. It has suitable facilities for all ages and abilities. Several biking routes meet at Geilo, a village known as the “gateway to the fjords”. While the mountain roads in the local environment are well suited for shorter trips, there are options available suitable for beginners, families and more adventurous mountain bikers who can enjoy cross-country, trail biking and downhill cycling. 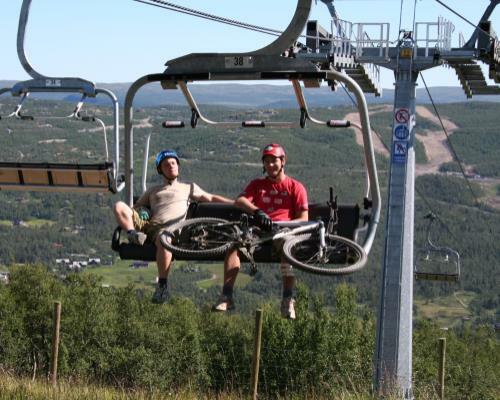 Project Travel can arrange flights and accommodation for your cycling Summer activity holiday in the mountain village of Geilo between May and September. Accommodation options range from self-catering chalets to luxury hotels and everything in between. Our packages are suitable for everyone from solo travellers and couples to family groups, cycling and mountain biking enthusiasts and bike clubs. We arrange transfers from Oslo by road and/or rail and if you want to combine a visit to Oslo, the fjords and Bergen for a few days, we can include that too. If you would prefer to hire a car, just let us know and we will include it in your tailor made tour package. One of the most popular ‘easy’ routes in Geilo is the Ustedalsfjorden Tour, a cultural and scenic trail which is popular for the whole family while the Geilo-Prestholtseter Tour is also a magical experience. There is a Bike Train (a train that transports bicycles) on the Bergen Oslo Railway which runs from Oslo to Bergen and stops in Geilo. During the high season a train leaves daily from Geilo and an ideal half-day cycle tours is to take the train to Finse and cycle back to Geilo, a distance of 27 km. Explore Eventyrvegen (The Adventure Road), The Numedal Route, the mountain roads towards Prestholtseter, Tuva or around the Ustedals Fjord. More adventurous bikers can enjoy cross-country, trail biking and downhill cycling. Slightly more challenging, these routes utilise gravel and cart roads. A number of trails in Geilo are just challenging enough, without being too difficult. For more experienced mountain biking cyclists we recommend a trip to Urundberget and then to Tuftelia. Geilolia Adventure Park has a open chair lift in the summer for downhill biking. It is open each day from 26th June to 15th August, between 11am and 4pm. Choose from easy family tracks to challenging tracks for the more experienced. 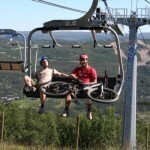 You can easily hire all types of bicycles in Geilo including downhill bikes and cross-country bikes. In addition you can rent saddlebag, pump, baggage cart, safety equipment and child seat. A cycling helmet is included in the price. Please contact Project Travel to discuss your requirements and we will create a tailor-made cycling holiday in Norway just for you.